Many people have noted similarities between Nolan's sprawling space epic and Stanley Kubrick's monolithic (yeah, I should feel bad) 2001: A Space Odyssey. I thought, going in, that I might see a few commonalities. But what I saw instead was the answer to Odyssey. And it's fitting, now a decade into the 21st century, with climate change and various forms of destruction on our minds, that Christopher Nolan's answer to Kubrick can be summed up in five words. It's not Them. It's US. 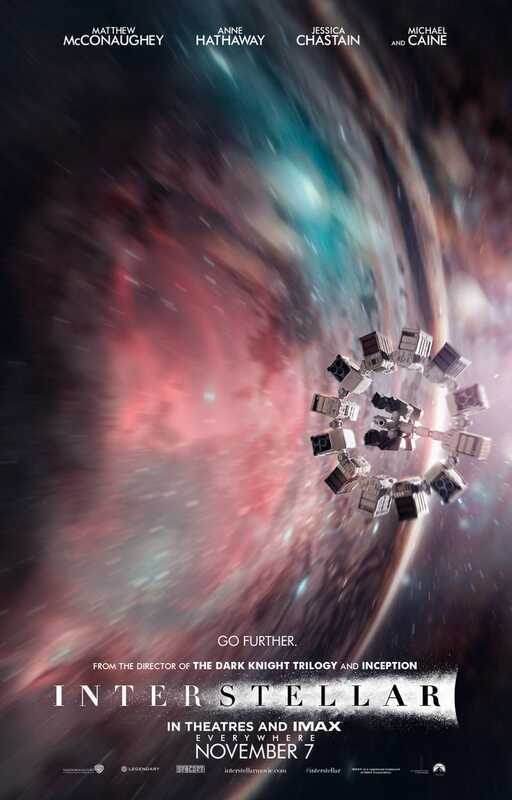 Interstellar doesn't just nod to Odyssey— it mirrors, then inverts it. And in doing so, it changes the answer. The film starts with man in a primitive, subsistence state, purely focused on survival. And yes, I'm talking about Interstellar, not about the apes in Odyssey. But it works out to the same thing, ultimately, except that the apes had nowhere to go but up. We as humans have fallen from heights — as Matthew McConaughey's Cooper intones, "We used to look up and dream at our place in the stars. Now we look down and wonder at our place in the dirt." The message is clear, and reiterated over and over. We are no longer explorers, innovaters, thinkers. We are caretakers. Farmers. We don't think — we survive. It leads him to the remnants of NASA, to dreams of intellect and exploration beyond a basic subsistence. It leads him into space, just as the monolith among the apes leads directly to the joyous strains of a symphony celebrating men in the spinning wheel of a spaceship. Nolan keeps the iconic shape of the ship — why wouldn't he? Not only is it a strong visual clue, but it has irresistible ties to the medieval concept of the Wheel of Fortune, spinning to determine our fate. The ship is a circle. The wormhole is a sphere. Time, as we will see, spins around and back again. We find a wormhole buried deep in space (mirroring Kubrick's second monolith buried on the Moon). It is the second gateway. Of course, anyone with a passing acquaintance with Odyssey knows the film's second act. It's Hal. Nolan gives us rectangular, black, boxy robots (again, mirroring monoliths) with data running across their screens — but interestingly, robots who move, who have arms and legs, who already are the anti-Hal in their human voices, jocular tones, distinct personalities, and cheerful awareness of their role as robots. That, in addition to a rather heavy-handed conversation between Anne Hathaway's Brand and Cooper about the nature of evil in space (hint: Brand thinks it isn't naturally occurring, but that we bring it with us) ought to be a clear hint where we are headed. Nolan makes a light attempt at misdirection — yes, the robot does intercept a potentially dangerous message, much as Hal overhears a conversation he's not intended to in Odyssey. But this is an inversion, and so you ought to know that the minute Matt Damon's pointedly named Dr. Mann awakens from hyper sleep that this robot plot is not that one. The warning bells go off quick and often with Mann (that name, it kills me), and it's a stroke of brilliant casting. In Odyssey, part of the jarring juxtaposition was the fact that Hal, for all his calculating evil, seemed in the end more human than the actual humans. Hal dies repeating, over and over as he is being dismantled, "I can feel it, Dave. I can feel it." His voice is calm, but he might as well be screaming. He dies singing, a slow slurry of technology ultimately failing mankind. But this is Interstellar, and evil comes from us. Matt Damon — who could have been better? The trustworthy face, the disarming demeanor, the pity we naturally feel for someone left alone so long without hope, all add up to more misdirection that never quite takes. Because, you see, Dr. Mann had a monolithic robot too, and it's been dismantled for unconvincing reasons. In that moment, I saw echoes of Hal dispatching the first astronaut in total silence, and I said it under my breath: "He's going to try to kill Cooper." Logically, Mann has to. He is Hal in reverse — a charming human being who has gone cold, and who, instead of caring about the larger mission, really only cares about his own self-preservation. He takes Cooper for a walk, monologuing about love and connection and the longing for survival, all tying back to Cooper's desire to see his children again, and you're waiting, any minute, for him to sigh, and say "I'm afraid I can't let you do that, Cooper." And since this is a reversal, Cooper doesn't have to deactivate Mann/Hal. He lets him do it himself, in a neat nod to doors and airlocks that open, or don't. And now, for act three. Odyssey's final act may be most famous for its incomprehensible, eerily surreal imagery as Dave Bowman travels through a wormhole into another plane of space/time. He ends up in an ornate bedroom, familiar, but so familiar as to be impossibly frightening and wrong. He lives his life there. He dies there, reaching for the monolith, even in his last moments reaching for the chance to be something more than human. That wish is finally granted in the film's final scenes, to the swelling of "Thus Spake Zarathustra," as we see him reborn as a higher level of being, looking over the earth with a serene, knowing eye, at the beginning of a whole new stage of existence. Humanity, transcended. Cooper wakes up in a white hospital bed. (I'll admit — I snorted with laughter here. It felt like Nolan's elbow nudging us: "Get it? Get it??") And no, it's not home. It's a new existence, a new way of life — but a distinctly human one, that imitates and celebrates humanity and Earth. The monoliths are here again. As Cooper walks into the replica of his home, now a museum, they are everywhere — and they have faces. Tall, black TV screens are filled with images of people recounting their stories of survival, of triumph in the face of disaster. Old, wrinkled, human faces that are here because of humanity and stubborn ingenuity. No transcendence. No evolution. Just — life, beyond Earth. And in the end, Cooper finds his fulfillment as he (and his robot, now with adjusted humor settings!) go in search of that most human of impulses — connection, friendship, and maybe love, with someone who can understand the human struggle. Humanity survives. It thrives. It conquers. And it doesn't need fifth-dimensional beings or giant black monoliths to do it. Nolan's message is a clear answer to 2001: A Space Odyssey. Humanity doesn't need divine intervention, because we are human. We will save ourselves. But it's an answer, all the same, to the question Odyssey posed. Who will save us, improve us, bring us to a higher plane?